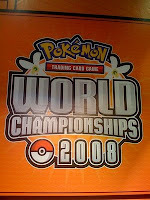 I’m at the 2008 Pokemon World Championships today in Orlando with my daughter. Right now there is a Video Game Showdown going on featuring the top 64 players from the U.S. and Japan - 32 American players and 32 Japanese players divided into two age brackets competing. First place winners of the video game showdown will each receive a grand prize that includes a six-day vacation package to New York City, Honolulu or Tokyo. The Pokemon Trading Card Game (TCG) World Championship is also going on and is much bigger with over 350 players (divided into three age brackets) from 30 countries competing to be named the ultimate World Champions of the Pokemon Trading Card Game. Top TCG winners will get prizes and merchandise, including scholarship awards totaling $100,000. Maybe you’ve only been exposed to the animated Pokemon television show or maybe you’ve got siblings or kids or grand kids who have collected Pokemon cards or played the Pokemon video games. These tournaments are intense – both the video and card games require a high level of skill, strategy and creativity. Games also stress fairness, honesty, respect and learning. All qualities we want to see in our kids - especially our science, math, engineering and technology students. This is a very impressive bunch of kids! You are right, a very impressive bunch of kids. What I found to be the best about it was how they all got along so well given such a diverse background they all had. It's pretty interesting to compare and contrast that with the World Yo-yo Contest, which I went to. They both take place in Orlando Florida in a Hotel and both have the majority of competitors from the USA and Japan. It does seem like a different kind of crowd, though.